1. Light your barbecue. In a large bowl, mix together the zaatar, frozen parsley, frozen garlic and olive oil. Tip the defrosted prawns into the bowl, stir and set aside. 2. Cook the frozen beans in boiling water for 3 minutes, drain and run under cold water. Snip into short lengths. In a bowl, mix the beans with the cucumber, radishes, tomatoes, mint, sumac, lemon zest and juice, pomegranate molasses, olive oil and a few pinches of crushed sea salt. 3. When all the coals have turned white, barbecue the pitta for a few minutes on each side until lightly golden, then set aside. Barbecue the prawns for 6-8 minutes, sprinkling them with flaky sea salt and turning regularly until they are pink and cooked through. 4. Break the pitta into bite-sized pieces and toss with the salad. 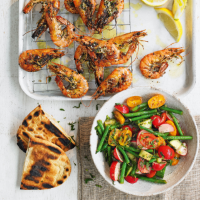 Tip onto a platter and serve with the barbecued prawns and lemon wedges.